Right-click on the map to open the context menu and then select Convert route to path. Right-click on the map to open the context menu and then select Add path. Click on the map to add new path nodes. Click on the end node to finish drawing. to split the path at this node. Right-click on the map to open the context menu and then select Import paths. Select a gpx or sltp file. Right-click on the map to open the context menu and then select Add point of interest. Right-click on the map to open the context menu and then select Import points of interest. Select a gpx or sltp file. Title and description are useful for information that isn't shown on the map. Upload images of your tour and add captions. Select the properties that match your tour the best. Start with creating a new variation by entering a name and add path segments to it. Set if and how you want to share your tour. Load and save tour data to your local storage or use the cloud for storage. The closest matching location will be shown as a marker. Search queries have to be in the form [What] in/near [Where]. 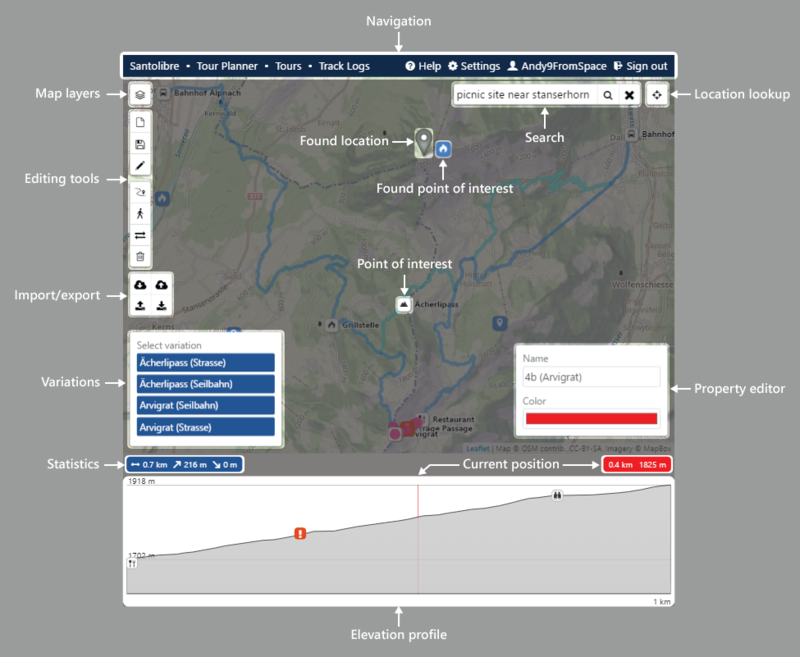 The closest matching location will be shown as a marker and the points of interest as markers. The center of the map will be shown as a marker and the points of interest as markers. playground, atm, bbq, italian restaurant, cinema etc. Point of interest search currently works for Europe and North America and in English only and OpenStreetMap data is imported once a week. to limit the tours shown. Track logs recorded with GPS Logger and uploaded to Santolibre Track Logs will be publicly accessible.